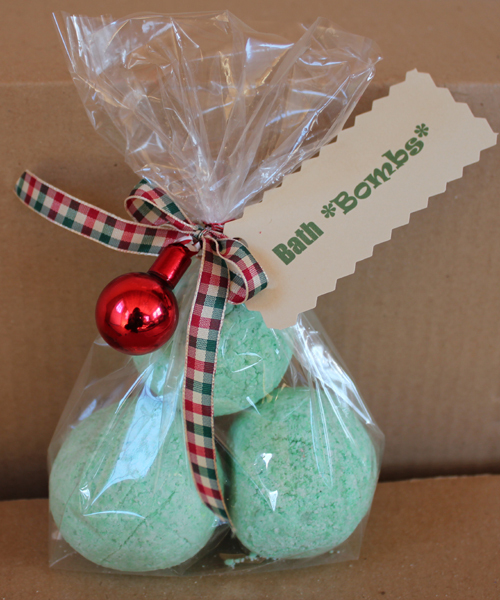 Bath bombs (aka bath fizzies) are a fun project to make at home and a fun gift to receive. They can be a frugal addition to a spa gift basket — or, creatively packaged, they’re a great gift idea just by themselves. Kids LOVE making bath bombs because it’s like playing with Moon Sand and the “crumbs” leftover when you’re done making them are fun for them to drop into water to see the fizzing properties of the citric acid in action. I experimented with multiple “recipes” for bath bombs before I figured out how to get it just right. The first couple times I made them, I was following a recipe that had a small amount of water in it. It caused my bath bombs to start the fizzing action and expand before they had hardened. The final bath bombs recipe that worked the best for me is the one you see below. It calls for witch hazel instead of water, which seemed to do the trick. Mix the dry ingredients in a large mixing bowl until well-blended. If you have a sieve, that may work to get any clumps out. Mix the first four liquid ingredients together (vegetable oil, food coloring, fragrance oil, and borax) in a small bowl. Pour the witch hazel into a spray bottle and reserve for later. With a wire whisk, slowly pour in the liquid ingredients into the larger bowl with the dry ingredients. You’ll need to work quickly and stir constantly so the dry ingredients don’t clump together or start their fizzing action. Spray the mixture with witch hazel to moisten very slightly, until the mixture takes on the consistency of damp sand. Avoid making the mistake of getting it too wet, which will cause the mixture to expand. You’ll only need a few sprays of the witch hazel. Right away, put the mixture into molds to harden. 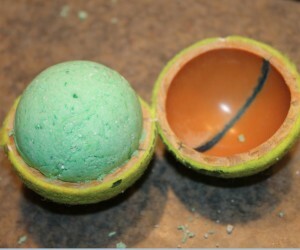 A tennis ball cut in half works well for round bath bombs. 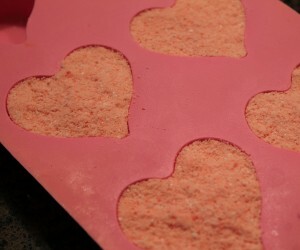 I had these heart-shaped Jell-O molds (pictured) that also worked well. Leave the bath bomb mixture in the molds 5-10 minutes to allow it to dry slightly. 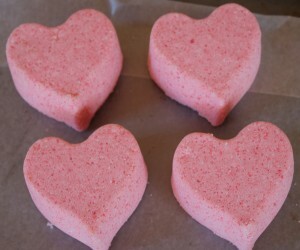 Remove the bath bombs from the molds and allow to air-dry for a few days. 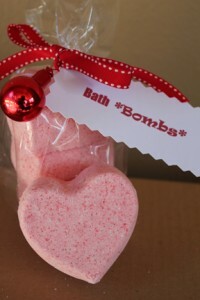 Package and give your bath bombs as gifts. Or, enjoy them yourself! Thank you SO much for sharing this recipe. I cannot wait to try it. I love this! I can’t wait to try it! Thanks for sharing!! I know what a few people are getting for Christmas ;). This looks like an easy gift idea for my daughters to make for their aunt. these were so much fun! thanks!!! If I put these in a well-heated room, will they dry faster? I am guessing yes, Alicia, but I don’t know for sure. Just don’t put them in the oven. That will activate the citric acid and you’ll have a big mess! I’m not so sure I would want some of this stuff in my bath tub… But it is a cute idea. I went in a upscale shop in Las Vegas and they had these for Sale. They had them displayed beautifully and a sink area where you could wash your hands with them. They leave your skin feeling so soft. Where do you get the witch hazel spray? I got witch hazel at Walgreens, and put it in a spray bottle. Do you need the witch hazel spray to make these or is it just an option? I got my witch hazel at the Family dollar. It was next to the hydrogen peroxide and alcohol. It comes in the same size clear round bottle. Is there anything that could maybe replace the Borax in the recipe? My son has eczema, and I would think that would be a little harsh for his skin. Cute idea! I would use some skin loving and moisturizing oil and butters to counter the drying effect of borax or use kaolin Clay or cornstarch instead, great for the ones with sensitive skin. wondering where to get Citric Acid?? Denise, I got citric acid at our local food co-op. Try health food stores too. Thanks! This is great and will be my low-budget x-mas presents this year. We are going to use this recipe For a moms group. There are 40 moms and we are trying to keep our cost down, as best we can. Could I substitute something less expensive for the essential oil, that smells good still? Maybe baby oil? This was awesome! However the humidity (in Aussie Summer) caused my bombs to fizz out while setting 🙁 not to worry, they still sort of worked! smelled lovely at least. How many does this make? It totally depends on the size of the molds you are using. How many does this recipe make if you use the tennis ball mold that is mentioned in the article? I’m making a lot of gift baskets for Christmas and I’ll need several that size. 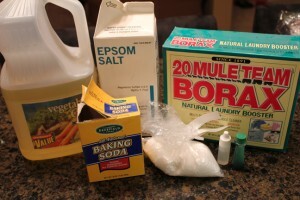 Is Borax safe to soak in? I am not quite sure I would feel safe using a bath bomb with Borax as an ingredient and most definitely wouldn’t want my kids soaking in a tub with Borax.